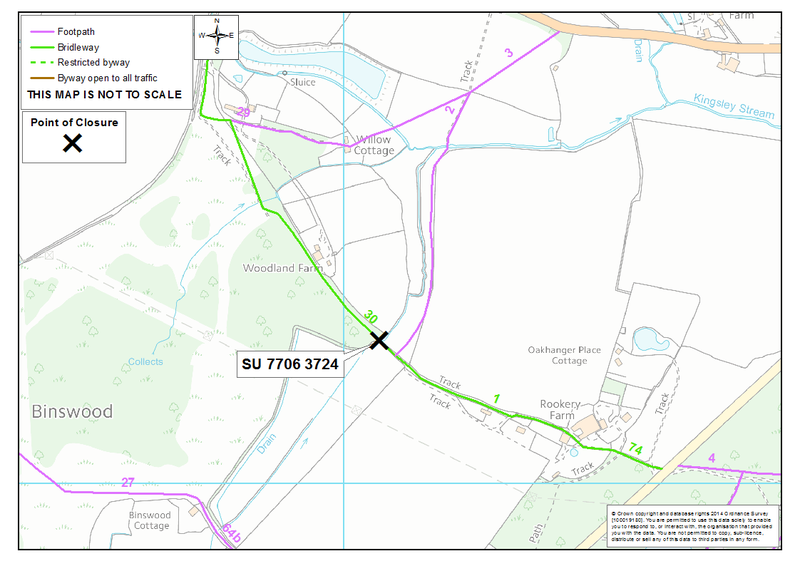 The temporary closure of Kingsley Bridleway 1 has been extended by a further 12 months until 12 June 2015. During my time at Old Park Farm I was in charge of the pig and poultry units and the pig unit or piggeries were located opposite the village shop. I note with a degree of sadness that planning permission has been put in for on the site of "the old piggeries". The last time I passed that site the buildings were in a pitiful condition, particularly so the oldest unit which runs parallel to the track. That unit in my day was a very nice old building with a tiled roof. It housed weaners and at the end of the building, to the east, were two boar pens. The main building was a Danish type piggery in which large numbers of pigs were reared to both pork and bacon weights with just a few going on to make heavy hogs. The other set of buildings ran down the eastern edge of the property from north to south and backed on to Mr. & Mrs. Daws’ garden. Built in one long row these were the farrowing pens into which the sows went when they came in from the fields to give birth. The sows spent most of their time roaming in the series of paddocks which ran behind the piggery from the rear of the then, newly built bungalows, to the east and to the west as far as Mr. Inwood’s property. These paddocks were planted with various seed mixes which produced varieties of greenery considered to be beneficial to pigs. Chicory and dandelions formed the base of those mixes. The sows stayed in the paddocks throughout the year and were provided with the round type of pig arks for shelter.We had very little in the way of health problems and the animals all seemed to thrive upon this regime. Whilst they were out in the paddocks they were moved up and down the row as they cleared each paddock of its vegetation. For most of the time they had a boar running with them in order to ensure that all of the sows were kept in pig. By and large boars are reasonably placid and during the whole of my time working with pigs I was never attacked by one. At Kingsley we had a mix of Landrace and Large White pigs, the Large White boars were huge. It was the accepted wisdom that lop eared pigs were less dangerous than prick eared breeds, the theory being the lop variety could see less as their ears dropped over their eyes. In my opinion this idea was spurious to say the least. Make a piglet squeal in front of a lop eared sow and she will undoubtedly come at you like an express train lop ears or not. As with most animals the best way of staying safe is to gain their confidence by petting, rubbing, giving tidbits and generally treating them as pets, this works just as well with pigs, and stood me in good stead throughout my time with them both at Kingsley and Lindford. Today I have a Berkshire boar called Norman who, since he lost his partner, has become something of a pet and is a gentle pig. However, the golden rule must always be, never take anything for granted and handle with care. But back to Kingsley,a female pig is known as a gilt until she has had her first litter, after which she becomes a sow. I suppose in many respects pigs are no different than any other animal and, like other females, can be nervous and unsettled when producing their first offspring. It is also the case that the number of piglets produced in a first litter can vary widely. Generally the pig breeder will hope for a litter in double figures but gilts can, and often do,produce litters in the lower single numbers. Added to this the nervousness and restlessness experienced by some gilts will go to ensure that piglets are trodden or laid upon. The pig called Dorris came into the world as a result of such an event. She was born into a litter of three from a mother who was a gilt. Within a couple of days mum had reduced her family to one. In economic terms it is not a good idea to keep a female pig with one piglet, it is better to cut your losses, take the piglet away from its mother and put the sow back to the boar. The sow will come into season within a few weeks and the whole process will begin again. Deprived of her mother, I began feeding the piglet from a bottle. Pigs reared in this fashion become very tame if not precocious. This one was no exception and she followed me around as though I were her real mother. Demanding food as and when she felt like it she would jump up and dig her snout into my leg in order to get the attention she required. She also quickly discovered that I stopped for my lunch each day and the sandwich box contained goodies which she became very partial to. In addition to all of this the local children became aware of the piglets presence and the piggery became a regular stop off for them on their way to and fro school. Being very tame the piglet would allow itself to be stroked and picked up by the children the numbers of which increased daily as the piglets reputation spread. At the time the village shop was located on the far side of the road exactly opposite the piggery and the owner, Mrs. Pethybridge, Dorris, was working within the shop. Dorris was a font of information regarding all things in the village and was kept fully abreast of all doings as a result of the numerous customers entering her shop each day. The Alton / Bordon buses all stopped outside the shop on each side of the road depending upon direction of travel. Thus the sources of information available to Dorris were indeed great and it would appear that she maintained a considerable knowledge by which she was able to answer most queries that came her way. If she did not have an immediate answer she could be relied upon to get one,usually, within a matter of hours. Such was village life. In any event, Dorris became aware of the regular and quite large groups of children visiting the piggery, right in front of her eyes, and on a regular daily basis. It became clear that the good lady was tempted out of her shop front door in order to observe this daily event and, no doubt, to familiarize herself with the cause thereof. Consequently the children became aware of this attention and, children being children, they quickly decided to name the piglet Dorris. Needless to say, the more I tried to dissuade them the more popular the name became. In so doing it caused me considerable embarrassment. I used the shop most days and I got the feeling that the human Dorris fairly and squarely blamed me for this turn of events. It became, you see, the daily practice for the visiting children, upon arriving at the piggery, to call out in high voice, "Dorris" both to summon the piglet and no doubt to annoy Mrs. Pethybridge which clearly it did. Sometimes you just have to admit failure and so it was with this matter, try as I would to dissuade the little devils from using the name they continued to do so. Dorris, then …….the four legged one, became something of an attraction and inevitably the general farm manager, Tony Hicks, became aware of the matter. He visited the piggery most days and was obviously aware that the piglet existed and had free range of the area. One day whilst visiting Dorris came snuffling around him and he said, "I want you to get rid of that pig". We couldn’t, he said, have a piglet running around the place it wasn’t right. What, I asked do you mean by, "get rid of it ?" He made it pretty clear that the pig had to be put down and I made it pretty clear to him, if he wanted it put down, he was the one to do it as I would not. It, therefore, transpired that it didn’t matter how I got rid of it as long as it went, just take the wretched thing away. I was aware that our piggery neighbour, Mr. Inwood, had a number of vacant pig pens. He had some years earlier kept quite a number of pigs himself. I approached him and asked to use one of them, to cut a long story short, we reached an agreement whereby, in return for the use of the pig pen, I would keep down the nettles which had got out of control. So it was that Dorris left the Old Park Farm piggery and took up residence in her new pen. She remained there until reaching maturity. I sold her to my uncle who then had a piggery at Bordon and Dorris went on to live a long and productive life thereafter. NOTICE IS HEREBY GIVEN that Hampshire County Council proposes to make an order to allow Openreach (BT) to carry out cable renewal works. ROAD TO BE CLOSED: That part of Oakhanger Road, Oakhanger between its junction with Lions Field and its junction with Church Service Road. 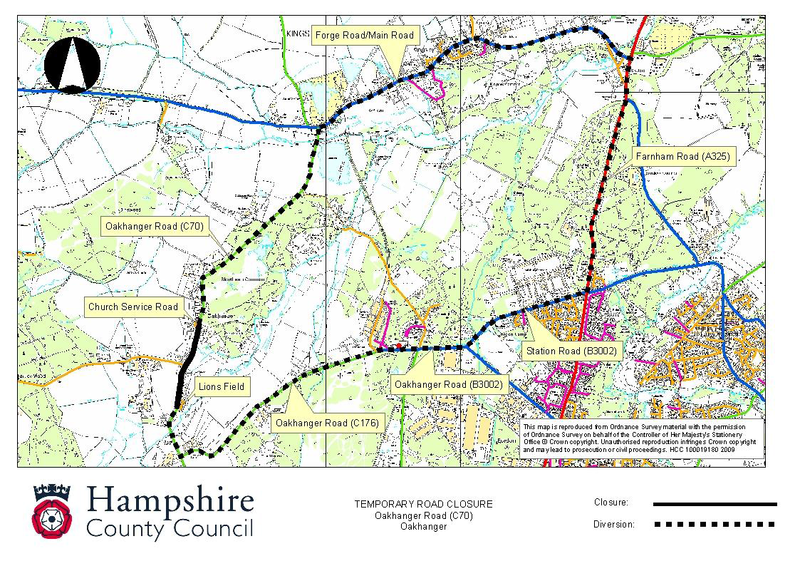 ALTERNATIVE ROUTE: C70 Oakhanger Road; B3004 Forge Road/Main Road; A325 Farnham Road; B3002 Station Road, Oakhanger Road; C176 Oakhanger Road; C70 Oakhanger Road (from northern point of closure to southern point of closure).